The expertise in PGM-free catalyst synthesis, characterization, and fuel cell testing at LANL is built on decades-long experience and proven results, and is the most important capability within LANL’s PGM-free program by far. The numerous major accomplishments in catalyst design, oxygen reduction reaction (ORR) activity, performance durability, and electrode optimization by LANL researchers have earned LANL’s program international recognition as perhaps one-of-a-kind in the world. The synthetic expertise included in this capability has been developed over the past 15 years and the resultant methodologies have proved indispensable in developing catalysts with unique compositions and morphologies, obtained by varying synthetic approach, precursors, and post-treatment conditions. Several catalysts developed by the expert team have shown exceptional fuel cell performance. Characterization expertise is supported by a robust set of analytical techniques that provide information key to understanding PGM-free catalyst behavior in the oxygen reduction reaction (ORR) and for understanding the spatial distribution of performance losses in PGM-free MEAs, as well as by significant electrochemical and fuel cell testing capabilities that are supported by nearly 40 years of continuous fuel cell technology and materials development at Los Alamos. 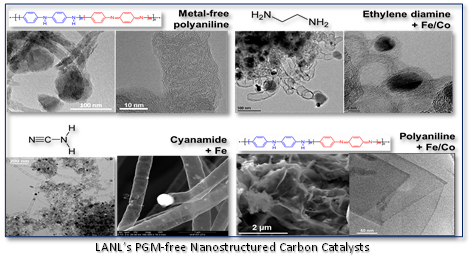 LANL’s unique PGM-free catalyst synthesis expertise lies in the approach developed to fine-tune the activity and selectivity of PGM-free catalysts for the oxygen reduction reaction (ORR) through the use of specific precursors and synthesis processes. LANL’s synthesis expertise comprises: (i) chemical synthesis routes for PGM-free catalysts at low temperatures and high temperatures, (ii) synthesis by ultrasonic-spray pyrolysis, (ii) polymer-assisted deposition routes for bulk powders and thin films, (iv) electrospinning, (v) freeze drying, (vi) high-energy ball milling, (vii) multiple batch and plug-flow hydrothermal reactions, (vii) catalyst modification using an oxygen-free wet glove box, (ix) electron beam evaporation and novel RF magnetron sputtering, (x) rapid expansion synthesis of ceramic supports, and (xi) controlled synthesis of carbon nanostructures, such as graphene and carbon nanotubes, which have been found to enhance the performance and activity of PGM-free catalysts. Lastly, a feedback loop from theoretical modeling to modified synthesis processes permits the rational design of desired active site structures in PGM-free catalysts for improved activity and durability. Additionally, LANL offers expertise in several techniques for analyzing essential characteristics of PGM-free catalysts, including surface area, pore-size distribution, and transition metal content. All of these properties affect oxygen reduction reaction (ORR) performance of PGM-free catalysts, and particular techniques for which expertise exists include surface area and pore size analysis, mercury porosimetry, and inductive coupled plasma mass spectrometry fitted with a laser ablation system. Finally, LANL’s expertise in electrochemical and fuel cells testing can be leveraged for carrying out accelerated stress tests (ASTs) for the characterization of the stability and durability of catalysts, the determination of kinetic parameters, and assessing PGM-free catalyst integration and performance evaluation in membrane electrode assemblies (MEA). Multiple test stations at Los Alamos are dedicated to PGM-free catalyst development and are programmed for DOE recommended AST protocols. LANL’s toolsets for PGM-free catalyst synthesis, analysis, and testing are also available for use in conjunction with guidance offered, and more details on this equipment will be provided upon request. The catalyst synthesis capability at LANL presents very few limitations. They may be specific to the design of certain PGM-free catalysts. A major advantage to LANL’s synthesis approach is its simplicity, which allows to bypass challenging synthesis steps that may be required in future PGM-free catalyst synthesis approaches. Analysis techniques are limited to dry samples. LANL’s PGM-free catalyst synthesis methods are as straightforward as possible and benefit from the established theory-to-experiment feedback loop described above. ICP-MS coupled with a laser ablation system can accurately detect transition-metal content in PGM-free catalysts up to the parts-per-trillion level. A laser ablation system allows analysis of carbon-based catalyst samples. LANL electrochemical and fuel cell testing capabilities provide wide-ranging assistance in the evaluation of all fuel cell components, including catalysts, membranes, and bipolar plates. Availability: LANL’s catalyst synthesis and analysis expertise is and the supporting tools are fully available to ElectroCat. G. Wu, K.L. More, C.M. Johnston, and P. Zelenay, “High-Performance Electrocatalysts for Oxygen Reduction Derived from Polyaniline, Iron, and Cobalt,” Science, 332, 443 (2011). H.T. Chung, J.H. Won, and P. Zelenay, “Active and Stable Carbon Nanotube/Nanoparticle Composite Electrocatalyst for Oxygen Reduction,” Nat. Commun., 4, 1922 (2013). P. Zelenay, “Non-Precious Metal Fuel Cell Cathodes: Catalyst Development and Electrode Structure Design,” Hydrogen and Fuel Cells Program 2016 Annual Merit Review and Peer Evaluation Meeting, Washington, DC, June, 2016. Benefit: The main benefit of LANL’s PGM-free catalyst expertise is its potential to facilitate the continuing development of novel materials in the PGM-free materials space.